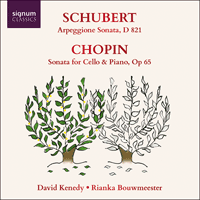 Cello and piano (and husband and wife) duo David Kenedy and Rianka Bouwmeester perform the sonatas by Chopin and Schubert (the latter originally composed for arpeggione, a cello/guitar hybrid instrument whose inventor Schubert perhaps wished to humour and which was rapidly forgotten). Hier find’st du deine Ruh’ ! It all began with a scream. The year 1814, when the composer was only 17, was to mark Schubert’s entry to the world as a mature composer and perhaps the greatest ever creator of song and melody. At the words “Ach, sein Kuß!” in his setting of a text from Goethe’s Faust, “Gretchen am Spinnrade”, the seemingly unstoppable semiquavers in the piano accompaniment representing the whirring of the spinning wheel come to an abrupt and shattering halt in three fortissimo sforzato chords, the memory of Faust’s kiss in stark contrast to the lost love and emptiness of life in an outcry of passion and pain that will recur in almost all of Schubert’s later major works. But this is not the whole story. Schubert’s growing sense of horror, intensified by the awareness of his own impending fate from the diagnosis of syphilis in 1822, is balanced (until the composition of Eine Winterreise in 1827) by an equal measure of joy in friendship, love, Viennese society, music, indeed all the pleasures of life, exemplified by the famed Schubertiade evenings, informal performances of his music, often also including poetry readings and more. Schubert was born in Vienna in 1797, the twelfth child of a peasant turned schoolteacher, and of a housemaid. He was a man of the people, sharing their hopes and worries, almost his whole life dogged to a greater or lesser extent by poverty. Physically, he cut a small, rather portly figure and hence came to be endearingly known by his friends as “Schwammerl”, meaning “little mushroom”, but Schubert was loved and admired by them as much for his modesty, generosity, honesty and sense of fun as for his musical genius. He died in great pain, his gift largely unrecognized and many of his finest works unknown. In 1824, disappointed by the recent failure of his opera, Alfonso und Estrella (despite the fact that he considered it one of his finest works), Schubert returned to instrumental music on a smaller scale. As Bach had been stimulated by the recent invention of a five-string cello (with a top E string) to emphasise the Sixth Suite’s position as the crowning glory of the set by writing in a higher register for the instrument than in the previous five suites, Schubert was clearly motivated by the arrival of the six-stringed arpeggione, a strange hybrid of a bowed instrument with the extended range and possibility of fast and accurate leaps and runs facilitated by its Classical-guitar-like stringing (E-A-D-G-B-E). The incorporation of frets was designed to make playing easier and intonation more accurate—Schubert was obviously unaware of the potential flaws of this new instrument, namely the difficulty of crossing strings cleanly due to a reduced differential angle at the bridge, the limited dynamic range, (the arpeggione was a smaller-bodied and quieter instrument than the cello, one on which application of too much downward pressure of the bow would result in hitting adjacent strings) and the restriction of expressive powers that was the inevitable consequence of the use of frets. It seems likely that Schubert typically wrote this sonata largely as a friendly gesture towards the instrument’s inventor, Vincenz Schuster. The increasing dynamic range of the piano would have made balance and projection even more problematic—no wonder that, after little more than ten years, the arpeggione succumbed to rapid extinction. Schubert was born into a musical world dominated by the colossal figure of Beethoven. It is a mark of how much the younger man was in awe of the great master that on his deathbed he asked that his body should be buried in a grave next to that of his idol (which it was). Compositionally there are many similarities between these two composers, most obviously their use of predominantly Classical forms and their prowess in almost all areas of instrumental and vocal writing with the notable exception of opera. This said, Schubert appears the more introverted and perhaps the more sensitive and fragile of the two, generally more at home in the smaller, more intimate forms of music-making (quartets, sonatas and of course Lieder) than in larger scale works. And while Schubert’s later symphonic works are second to none, it is interesting to note that he was one of very few Classical composers never to write a concerto—it was against his nature to write a piece with the intention of showing off his own ability or those of the performer and instrument he was writing for. And while Beethoven would frequently struggle to find a theme or melody for his work, with Schubert this was an apparently effortless process—all came from song (Schubert wrote more than 600 Lieder). Beethoven’s later experimentation with form made him a revolutionary, but with Schubert it is the predominance of melody, and especially the emotion it conveys, that sees him moving towards Romanticism. The Arpeggione Sonata was written in 1824, soon after the Schöne Müllerin song cycle and shortly before the Great C major Symphony of 1825-28 and the C major String Quintet of 1827, perhaps his finest instrumental works. It is written on a smaller scale, with three movements: a sonata form allegro moderato, a heartfelt, singing adagio and an allegretto rondo movement whose interludes are bursting with variety and energy. The first movement, in A minor, is imbued throughout with a touching blend of sadness and joy (as was Schubert’s own life), the beauty, sensitivity and lyricism of its first theme contrasting with the carefree nonchalance of the second, a shattering outburst of pain (like Gretchen’s scream) at the climax of the development section leading through the recapitulation to the last breaths of the instruments and culminating in the death sentence of the two closing chords. The theme of the second movement in E Major, unfolding like a love song, is clearly derived from the Larghetto of Beethoven’s Second Symphony and for a while shares the simplicity of the Largo of Chopin’s later Cello Sonata. However, a sinister undercurrent emerges, threatening the tranquil beauty of this world and anticipating the icy bleakness of the Winterreise. The movement ends, like its predecessor, in an experience close to death, the pace slowing almost to a complete stop before finding the most fragile of lifelines to carry the music through to the finale. The last movement begins as an ecstatic rondo, the gushing theme predominantly bathed in the sunshine of A Major, interspersed with energetic, lively interludes with traces of folk idioms and demanding considerable virtuosity from both performers. A nostalgic piano solo temporarily eclipses the spotlight on the string instrument before the final return of the rondo theme, ending with one of the many rising arpeggios that characterise this work, a positive and satisfying end to a composition that has reflected the whole gamut of human experience. Schubert died aged 31, Chopin aged 39, both tragically young. Like Schubert’s Arpeggione Sonata, Chopin’s Sonata for Cello and Piano, opus 65, was written close to the end of the composer’s all-too-brief life. Uniquely in this work, the composer himself implicitly acknowledges his affinity with Schubert by quoting directly from Eine Winterreise, the tale of a life’s journey through joy and sorrow, ending in loss, isolation and eventually in death. Similar motifs of a 3-note rising and falling semitone, found in “Gute Nacht” (the opening song of Eine Winterreise), “Erstarrung”, “Der Leiermann”, “Rast”, “Die Krähe” and “Das Wirtshaus” recur like a leitmotiv throughout the movements of Chopin’s Sonata. Chopin was born in 1810 in the village of Zelazowa Wola, near Warsaw. His father, Nicholas, was born in Eastern France and at the age of sixteen moved to Poland, where he was to marry Justyna Kryzanowska and remain for the rest of his life. Justyna played the piano and Nicholas the flute and violin, and they had four children. Shortly after his birth, Chopin moved with his family to Warsaw, already as a young child showing great sensitivity for both music and poetry. Chopin’s first teacher, Adalbert Zywny, encouraged him to explore the works of Bach and the great Viennese composers, and it was at this time that he started to compose. From 1826-1829 Chopin studied at the Warsaw Conservatoire with Josef Elsner, during which period he travelled to Berlin and met Mendelssohn, his first journey abroad and one which gave him a taste for the opportunities of musical life in Europe. Chopin moved to Vienna, the recent home of three of the great masters, Haydn, Mozart and Beethoven. It was here that Haslinger, who had published major works by Schubert and Beethoven, agreed to publish Chopin’s Là ci darem Variations. Chopin’s concerts in Vienna were a success and he met many influential people and made new friends, but on his return a year later he was disappointed by the changing taste of the Viennese audiences, who had turned away from Chopin’s poetic expressivity in favour of Strauss’ waltzes and other popular tunes of the day. In letters to his family Chopin hid much of his loneliness and disenchantment, but to his friends he wrote about his irritation, anxiety and frustration. He had always followed creative and political developments in his country, and the news of the revolt against the Russians in Warsaw caused him to worry about his family and friends in Poland and reinforced his homesickness. When Vienna’s political climate turned against the Poles, and due to his lack of musical success during this visit, Chopin moved to Paris in 1831, the city which was to remain his home until his death. The spirit and hospitable atmosphere of Paris were just what the young Chopin needed and new friendships were formed with composers and musicians including Liszt, Mendelssohn, Berlioz, Rossini, Cherubini and the cellist Franchomme, who all came to admire the young Frédéric both for his skills as pianist and composer. From 1835 Chopin began to focus increasingly on his own composition, and it was also around this time that he fell in love with Maria Wodzinsky. He proposed to her the following year, but though she accepted, her family forbade the marriage. To add to his woes, in the Parisian winters of 1835 and 1836 Chopin’s health deteriorated, and influenza made him seriously ill. The works of this period, including the famous Funeral March, reflect his depression and the struggle between inner peace and passionate turbulence. It was at this time that George Sand entered Chopin’s life. From their first meeting in 1836, he became increasingly interested in her independent spirit and strong views—with her he could express his thoughts and share his suppressed feelings. Chopin and Sand longed to be free from Parisian gossip, and when the opportunity arose in 1838, they left Paris for Majorca. The sense of freedom, beauty of nature and warm weather initially proved a wonderful combination for Chopin’s health, but with torrential rains later in the year, the cold and damp of the house caused his bronchitis to deteriorate resulting in their decision to return to France in February 1839. During the rough sea crossing, Chopin suffered a lung haemorrhage and was urgently in need of medical attention and rest. The following years, when Chopin spent his summer months at Sand’s house in Nohant, saw some of his most creative spells as a composer. During the winter months Chopin returned to Paris, but found composing more difficult here. From 1845, tensions in their relationship eventually led them to go their own ways. Chopin’s last meeting with Sand was in March 1848, but their relationship could not be healed. Chopin never forgot Sand and, until the day he died of consumption on 17th October 1849, he kept a strand of her hair in his diary. Polish earth was strewn over his grave and an urn containing his heart was brought back to Warsaw. This work is one of only nine compositions in which Chopin combines other instruments with the piano, and here he gives cello and piano an equal partnership. After the piano, Chopin felt his closest affinity with the potential of the cello for expressive colours and human singing qualities, an instrument for which he had written successfully before, working closely with Auguste-Joseph Franchomme to whom he dedicated this Sonata. Together they played the last three movements at Chopin’s last public performance in the Salle Pleyel in 1848. The Sonata was the last piece to be published during his lifetime and apparently the last music he heard before his death, Franchomme playing this work for him by his bedside. Chopin wrote and rewrote the piece over a period of two years, during the troubled time when his relationship with George Sand was breaking down and his health was deteriorating—he had never fully recovered from the previous bout of tuberculosis. The Sonata consists of four movements. According to Viennese tradition, the first movement, Allegro Moderato, is by far the most substantial, in this case matching the combined length of the other three movements. Much of the music is derived from the opening statement, a four-bar piano solo reminding us of the introductions of the orchestra in the piano concerti, followed by the opening motif in the cello, with its rising and falling semitone. It is a movement full of ideas, ballade-like features, inventiveness and beauty, all with an underlying sense of melancholy as well as passion and wisdom. Chopin links the Sonata movements by connecting melodic references throughout the piece. The opening motif of the first movement serves to open the dance-like Scherzo (Allegro con brio) in D minor, with its Mazurka feel and contrasting lyrical, cantabile middle section in D major. This motif returns in the beautiful, intimate and warm Nocturne-like Largo in B-flat major as well as in the riveting and magnificently exciting rondo of the Finale (Allegro), in which the melancholy of the G minor first movement has been replaced by a brighter G major conclusion. Maybe one of the reasons why Chopin omitted the first movement from the first public performance was the hidden reference to his feelings about his own broken relationship at the time, not wanting to risk the audience spotting the autobiographical link with the Winterreise. The Sonata explores two worlds, one of early Romanticism with simplicity in melody, texture and innocence, the other late/post Romantic with extended phrases, bolder and more complex chromaticism and harmonies, breaking away from convention. Combining these two worlds gives a sense of remembrance of the past as well as looking forward to the future. Feelings of melancholy, love, nostalgia, elation, hope, dignity, pride, and inner strength are all expressed in this astonishing work. As surely as the four seasons, our lives too seem to follow a cyclical pattern. My musical journey (after my mother’s singing over the cradle) began when my father introduced the magic of a record player and two boxed vinyl sets to our home: Bach’s Cello Suites and Schubert’s Winterreise. I am sure it is as a result of hearing the dark and soulful tone of Casals’ playing that I am a cellist today, and the tears I shed, at the age of five, on experiencing the beauty and purity of Dietrich Fischer-Dieskau’s voice singing those tragic, death-filled verses combined with the poeticism and evocative power of Gerald Moore’s piano playing that instilled in me a bond with Schubert lasting into my maturity. Ten years ago, at the age of fifty, I recorded Bach’s Six Suites for Solo Cello. Here, I am partnered by my beautiful wife, Rianka, to give you Schubert’s Arpeggione Sonata, neither Winterreise (certainly less tragic) nor a true cello work, but the closest we can approach the Schubert song-cycles in this duo formation. We have decided to pair this lovely piece with Chopin’s Sonata for Cello and Piano, a rich and complex work with its own roots in the Winterreise, bursting with passionate longing, pain, beauty and joy, energy and virtuosity. Interestingly, it is the last of Chopin’s works to be published in his lifetime and one I played at my debut recital at the Southbank Centre, the work at the end of Chopin’s career marking the beginning of my own. And the cover? Two slightly overlapping trees for summer and winter, joy and sorrow, light and dark, heat and cold, youth and old age, two masterworks by two master composers, linked by a poet’s bleak journey, all too aware of their own impending fate, two instruments intertwining at the hands of two performers united in love, music rooted in the ground and reaching for the stars, life and death. All is here. This recording is dedicated to the memory of my father, mother and father-in-law, it is a love-token for (and with) my wife, a gift to my four very wonderful children, my sister Ros and all our friends and relations, all those who are and have been part of our lives, and for all those who care to listen, and even those who do not. Music for everyone.